Zenish is a silks inspired studio, created by previous aerial studio owners Alana and Aspen. Together, they formed Zenish, accessible yoga for anyone. We encourage you to step outside of your comfort zone and fall in love with yoga like you've never seen before. All of our aerial instructors go through thorough training to keep you safe. Safety is our number one concern, all silks, instructors and reinforcements are above and beyond to ensure a safe and happy environment for all of our students. Hi! I'm Aspen! I originally obtained my RYT before delving deeper with over 400 hrs of continued aerial education. Originally, I hung a hammock in my house with no idea of what I was doing, fell and decided if this was something I was serious about I needed to get the proper certification to be able to safely and effectively grow in my practice as well as helping others. Aerial has helped me tremendously with back pain from three pregnancies, the last where I was on bedrest a majority of the nine months. I truly believe in the healing power of aerial and that it's for anybody and any body. I have three awesome kids who are the light of my entire world and a husband who is endlessly supportive. I absolutely love SUP and being outdoors. The water and the silks are my happy place. Combined with cupping therapy I focus on fascial release and healing your body from the inside out. You deserve a place to go and relax without any judgement or hesitation. We welcome you with open arms just the way you are. I started practicing yoga in 2003 but, found that I was looking for more out of my practice. I dabbled in other practices and it wasn't until recently that I really made a true dedication to myself and my practice. After going through a devastating tragedy I found myself lost and did not know where to turn. I looked deep into what I wanted and where I wanted to be in my life. Months later I found myself in yoga teacher training in Bali. My teacher training was life changing! I found my calling to reach out and help people going through life changes, big or small. I want people to know that yoga and meditation will help guide and change your life if you allow it. I have first hand experience of this! I live in one of the most beautiful parts of Colorado and I have 3 dogs, 3 cats, & two chickens (I am still a Certified Veterinary Technologist). Melissa is a RYT 200 yoga teacher and certified Silks inspired aerial instructor from Farmington. She loves God, her family, friends, yoga, art and spending time in the great outdoors. After practicing yoga for 10 years, she decided to become a licensed yoga instructor. She says that yoga has changed her life and that she cannot wait to share this amazing practice with our community. She also recently opened an art studio, The Busy Bee. As a student and graduate of Denver Integrative Massage School in Colorado, Lisa began practicing Thai yoga massage (nuad boran) over 5 years ago. Her background in movement + psychology cametogether with a more recent infatuation with all-things-natural-health and she was instantly attracted to this beautiful healing art. Over two trips to Thailand, she was able to experience this form of bodywork in various settings and study with Pichest Boonthume, who is considered one of a few (remaining) living masters. In the Thai tradition, massage is the physical embodiment of metta – the Buddhist concept that is often translated as LovingKindness. Lisa practices with this intention and strives to create a sacred space in which the client can engage with his/her innate ability to balance and heal. Working with both the physical and energetic aspects of a person, her work deeply supports health in the physical, mental, emotional and spiritual experiences of those who receive it. My intentional journey of self discovery began in earnest in 2000 when I dabbled in competitive ballroom dance. Dance being a VERY expensive hobby, I quickly found my way to Tae Kwon Do, a more regimented kind of dance. Earning a black belt was, for me, an amazing feeling of accomplishment. After suffering a fairly serious shoulder injury I had to find a new outlet for my energy, YOGA was it. And not just any yoga, but Bikram, hot, hot, hot! As I became more experienced I sought out various styles of yoga and have taken bits and pieces from each style and teacher I have encountered along the way. While attending my first yoga class at a new studio on March 7, 2014 I suffered a hemorrhagic stroke. A life changing moment that forced me to look at my life and decide if I was truly on my path or just following along on a well worn path of everyone else’s making. Fast forward 2 years and I am now a 200 HR yoga therapist and the proud owner of Ms. Kitty’s Country Inn in Mancos, CO. I love connecting with people and helping them heal through breathe and body work. Ha Thi started on her yoga journey in 2012 with a regular practice of Bikrim yoga. After three years, she explored other styles of yoga and discovered Vinyasa which changed the way she practices and made her floor practice stronger. She took her first aerial class at The Yoga House and loved the feeling of yoga in the air which inspired her to take the teacher training. She is very excited and honored to teach and guide her students through a different and fun yoga practice. Outside of yoga, she works as an Optometrist, practices a number of holistic modalities, participates in endurance sports races, and enjoys traveling with her husband and two labs. Molly is spending her summer in New Mexico volunteering and living in Aztec Ruins National Monument. She hails from Philadelphia where she earned her 200 hour certification from Grace and Glory Fishtown, a Baptiste affiliate studio. Molly's passion for nature and yoga are unparalleled. She specializes in Power Vinyasa and Restorative Slow Flow. She is so excited to be a guest teaching in Farmington and looks forward to joining the wonderful yoga community at Zenish. I took my first yoga class at Fort Lewis College in 2009, but it wasn't until I moved to Denver in 2011 that I really started to explore different styles and develop my physical practice. I loved the changes that I began to see in my body and quickly noticed my various aches and pains associated with an active lifestyle start to fade. When my personal life started to fall apart in 2013, I threw myself even deeper into my practice. In a world full of turbulence and pain, yoga became my escape. Through the hours spent on my mat, I learned to find peace and calmness in my mind, which eventually seeped into every aspect of my life. I wanted to help others find that same peace and happiness that I had found, so in 2014 I completed a 200 hour Hatha yoga teacher training at Yoga Pod Lodo in Denver. While working full time as an Environmental Scientist and supporting my husband through grad school, I worked as a substitute yoga teacher in addition to teaching a class occasionally at a women's homeless shelter. Now that we have relocated back to southwest Colorado, I am beyond excited to start teaching consistently and join the wonderful team at Zenish Yoga. In every class that I lead, I strive to link body and mind together through movement and breath. I hope you'll come join me and discover for yourself just what yoga can do for your life! Heidi gained a Bachelor of Arts in Dance in 2003 in her home country of Australia and went on to enjoy a professional career as a Ballet Dancer, performing with companies in Australia, New Zealand, The United States and Europe. With this background Heidi brings something special to her training sessions with a unique level of body awareness honed from years dedicated to training and performing. Bringing a positive spirit to every session and an enthusiasm for helping her clients reach their individual fitness goals Heidi has a passion for facilitating optimum movement patterns and offers customized safe and effective training for people of all fitness levels. American Council on Exercise (ACE) certified Personal Trainer, hiker, marathoner and Pilates advocate and instructor. A lifetime member of the Polestar Pilates Alliance Heidi is dedicated to furthering her education in order to provide progressive, innovative and inspiring training methods to advance each client physically and mentally. Sami is living and learning in Telluride, Colorado. 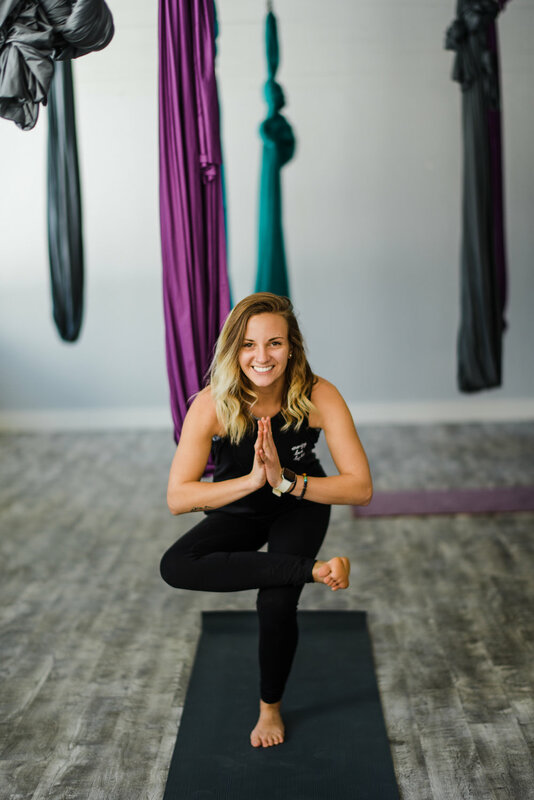 As a 200 hr RYT and recent graduate of Aspen and Alana’s 65 hr Aerial Yoga Teacher Training, she is honored to join the Zenish team! Sami has been practicing Yoga since 2012 and enjoys many different styles and traditions of this lifelong practice. Morgan is originally from Milwaukee, Wisconsin and has been living in Durango since March of 2017.She has lived in-between Colorado, Utah and Oregon over the last five years. While moving a lot, Morgan was able to learn and practice yoga with many different teachers, learning and growing as a yogi. She has her masters in Social Work and has been working in Wilderness Therapy since 2014. Morgan has been practicing yoga since college and recently completed her 200hr YTT. She is interested in expanding her teaching practice to those who have experienced trauma and incorporating yoga with her students at work and those who join her classes. For now, Morgan enjoys teaching new yoga students and guiding them to deepen and strengthen their practice. She enjoys incorporating pranayama and meditation into her classes and teaching others about the benefits of meditation in our day to day lives. Hanna is a 200 hr RYT who specializes in Power Vinyasa Flow with an emphasis on breath and movement connection. Since taking her first yoga class in 2014 she has fallen deeply in love with the practice, changing her life by giving her a sense of self-love and purpose. In her classes she strives to bring a sense of unity and intentionalism to the mat of each of her students. One of her favorite passages from Richard Freeman that she feels resonates with her style is “Within the physical practice of yoga, we work the body like we knead dough when making bread, so that it becomes transformed from an amorphous lump of unconscious flesh and bones into something that is vital and full of life. Through this work we find that both the body and mind begin to wake up; they begin to unite with each other and with our everyday experience of life.” When Hanna is not practicing teaching you can find her around Telluride rock climbing, skiing, mountain biking, or making coffee at Ghost Town. She also loves camping in her van, cuddling her cat Simon, and in the summer, laying on the beaches of the great lakes of her home state, Michigan. She is beyond excited to kick off her teaching career with Zenish Yoga Telluride and can’t wait to see you on the mat! Natalie is a Yoga teacher, student, and explorer of this planet. Her teachings stem from a deep desire to create a world rooted in compassion and kindness. Natalie's classes integrate a physical practice with meditation, breath work, sometimes some good tunes, and spiritual philosophy. In working with Natalie, her students learn a method for self discovery, connection, and are provided with tools to help them lead a more mindful, loving, and conscious lifestyle. Natalie is currently focusing on working with youth through Kids Yoga classes and Girlvana Yoga. Natalie can usually be found exploring the majestic mountains of her hometown in Telluride, Colorado with her husky and partner.